2014 has been a defining year for Francesco, with debuts with major orchestras all around the globe and a much-praised solo recording. Orchestral debuts include NHK Symphony with Roger Norrington, São Paulo Symphony with Andrew Manze, and Helsinki Philharmonic with Kazuki Yamada. Over the summer, Francesco’s debut at the BBC Proms with Thomas Søndergård and the BBC National Orchestra of Wales, where he performed Strauss’s Burleske and Mozart’s Rondò in A major, was praised in the British press: “Francesco Piemontesi sparkled with dashing insouciance, only to contrast that with playing of lyrical beauty in Mozart’s Rondo in A major, K386” (Financial Times). On the other side of the Atlantic, he performed Mozart Piano Concerto No.27 with the Cleveland Orchestra to an audience of thousands, as part of the Blossom Music Festival. Francesco made much-awaited comebacks to orchestras such as the Hallé in Manchester, and he toured Switzerland and Italy with Royal Philharmonic and Charles Dutoit. In November, a performance of Beethoven Piano Concert No.4 with City of Birmingham Symphony and Lahav Shani was described, in a five-star review on Bachtrack, as “…one of the most assured performances of the piece I can recall hearing”. In recital, Piemontesi returned to Rotterdam De Doelen, BOZAR at Royal Conservatoire Brussels and Wigmore Hall in London, and made his debut at Berlin and Vienna Konzerthaus. Mozart Piano Works, released in April on Naïve Classique, has garnered widespread acclaim for its maturity and refinement, consolidating him as “a Mozartian force to be reckoned with” (Jessica Duchen, BBC Music Magazine). Piemontesi ends the year with a return to some of the ensembles with whom he enjoys a longstanding relationship. Together with the Scottish Chamber Orchestra he performed Beethoven’s Piano Concerto No.4 at the Usher Hall in Edinburgh on 3 December, taking it afterwards to Glasgow Ayr and Perth. Two weeks later, he performed the same work with the Royal Northern Sinfonia and Thomas Zehetmair at Sage Gateshead, as part of the hall’s 10 years celebrations. Piemontesi also returned for a mini-tour with Orchestre de Chambre de Lausanne, playing at Geneva’s Victoria Hall on the 10 December, Salle Equilibre in Fribourg on the 11 December, and the Salle de Musique in La Chaux-de-Fonds on 12 December. He performed Dvorák’s Concerto for piano and orchestra in G minor, which he recorded for Naïve in 2012. The concert in Geneva has been broadcast live on radio RTS Espace 2, which you can listen to here. 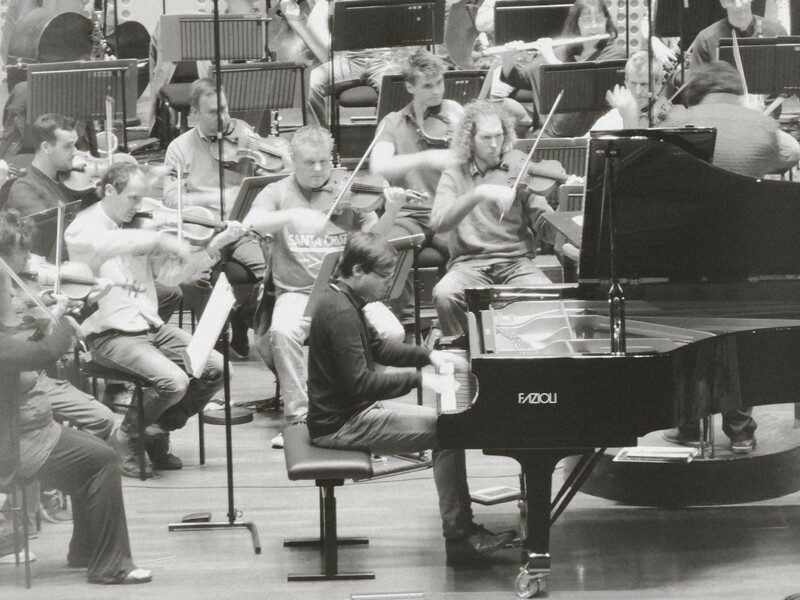 Francesco rehearsing with the Hallé in Manchester. Francesco’s performance of Beethoven’s Piano Concerto No.2 with the Hallé Orchestra was praised by the local press in Manchester this November. This was Francesco’s second collaboration with the orchestra after his captivating debut last season, returning to interpret some of Beethoven’s earlier work. He’s superbly equipped technically, but, more importantly, has wit and imagination that he can bring to bear in the most familiar classical works. It’s a matter of doing the little things well – like making real contrasts in his playing to match those written into the orchestral music, and catching an atmosphere of mystery, as he did in his first movement cadenza. British magazine the Spectator published a feature on Francesco ahead of his Proms concert with the BBC National Orchestra of Wales in August. Focusing on Francesco’s recording of Schumann’s Piano Sonata No.3 in F minor (Claves 2009), writer Damian Thompson praises him as a pianist of “refined, probing, uncompromising intelligence”, comparing his approach to the architecture of a piece, for example, to that of Alfred Brendel. Can you tell how intelligent a musician is by listening to him play? Last year I discovered a recording of Schumann’s Piano Sonata No. 3 in F minor, a sprawling and spidery work that can fall apart even under the nimblest fingers. Not this time. Francesco Piemontesi, a young Swiss–Italian pianist, totally nails it. Believe me, it takes some nailing. In the opening Allegro brillante and the final Prestissimo possibile, Schumann stretches lyrical melodies across madcap scales and arpeggios that dart in every direction. The rhythms are insistently dotted: Schumann at his most obsessive-compulsive. There are lots of crunching gear changes and scampering pianissimo passages that turn to mush if the pianist seeks safety in the sustaining pedal. Everybody has already received it, my managers, my pr agency, even amazon received it though they are not allowed to sell it yet. I seem to be the only one to whom the package has not been delivered. The package from Naïve with the first batch of my new Mozart CD. Yesterday I found an official letter from Deutsche Post in my postbox, telling me that my Mozart-package cannot be delivered since the address the package was addressed to did not exist. This letter, however, was addressed and delivered to exactly the same address. That’s at least the only thinkable reason why I found it in my post box. As a foretaste you can listen to the first movement of the f major Sonata K533 here, or watch this video with an excerpt from the recording session! My new Mozart-Album for Naïve will be released in a few days. In December I performed for the first time the last three Schubert Sonatas in one concert. I was looking forward to this event for years and I am thankful to Stefano Lania in Bergamo who insisted for having this project in his concert series. It is a rare and special pleasure when an organizer encourages artists to realize something they otherwise would not often get the possibility for. Years ago, when I first played the a major sonata for Alfred Brendel, he immediately animated me to perform these three masterworks in a single concert. He referred to them as a Kantian triad: A thesis of destructive and macabre energy in the c minor sonata, followed by an antithesis of positive activity in the a major is concluded by a synthesis of resigned sobriety in the last sonata. Schubert´s last sonatas belong together. The C minor Sonata is indeed a work with a high degree of turbulence, the writing sometimes being neurotic: Behind a classical surface the music reveals a high degree of unexpected turns: the main earnest and tragic character – derived at least in my eyes from the opening bars of Beethoven´s c minor variations – balances with sudden, rapid and conflicting shifts of moods. For istance, the dreamy second subject is developped into a most passionate idea which dissolves into a pensive final group. The devolpment which follows has an illusive, almost funeral mood. The finale, in tarantella rhythm reminds me of the spirit of a danse macabre. The second Sonata is in general the most luminous among the triad. Between the outer mouvements which bring a clear fiery and powerful (e.g. the starting chordal progression) and joyful (mostly in the finale) message we find the emotional heart of the piece right in the middle: the andantino starts in a grace or dance-like manner and slowly becomes a composition with a high degree of disturbance. The middle section sounds like a most scary scene. Until today I have not found a passage written until 1828 which appears to be so modern. The reprise of the main theme doesn´t remain unaffected by the outbursts: signs of disturbance can still be found in the shaking outer voices. The last Sonata is in my eyes the most moving one. As Claudio Arrau put it D960 “is a work written in the proximity of death…one feels it from the very first theme…the breaking off, and the silence after a long, mysterious trill in the bass.” Only in the finale we find stormy passages, which are preceded – as Alfred Brendel pointed out – by the kind of silence that anticipates storms. The apparently smooth harmonic structure of this sonata is in fact more complex than in the others. I tried for many hours to give a sense to my analysis of the piece. Finally the suggestions of US musicologist William Rothstein helped me to decrypth the piece. D958, 959 and 960 were written in 1828, however they were only published by Anton Diabelli around ten years after Schubert´s death. However, they were almost forgotten until the centennial anniverary of his death. Thanks to the writings of Sir Donald Francis Tovey and public performances and recordings of Arthur Schnabel they slowly received growing attention around 1930. I´m really astonished at how long it took until they finally became an important part of the repertoire. Historically, their public reception didn’t start in the easiest way: Schumann reviewed them in 1838 and showed his disappointment. The main criticism – still persisting today – is that of being too long, lacking in formal conciseness and in pianistic fireworks; hence not appropriate for an effective performance. According to contemporary witnesses, Schubert was not a virtuoso pianist in the style of Liszt. His piano playing was more on the introverted side: the main praise he received was for his singing tone. In one of his letters he writes angrily about the banging style of some virtuosos of the time. This aspect fascinates me the most; it is in the subtle tone colours that one gives sense to all tonal excursions, like the seemingly endless modulations in the development sections. The journey I started in 2008 led me through three of the most sublime piano pieces I ever encountered. A very big challenge for the performer is to shift continuosly between song-like writing (the resemblance with many aspects of “Der Atlas” in D958, “im Frühling” in D959 and “Am Meer” the opening of D960 is quite obvious) and the dramatic, drastic, fieverish texture he interpolates. Even more so, when these moments are hidden behind a smooth or innocent surface. I’m thinking in particular of the beginnings from the slow movements of the c minor and a major sonatas. Another important challenge is to find a way how to integrate the dance like episodes or mouvements into the principal character of each piece. Two recordings have been central to my study of these sonatas: Brendel´s live rendition of D960 from 1997 (for copyright reasons not available on Youtube) and Schnabel’s 1937 recording of D959. It is almost two years ago that I have been asked to become the new artistic director of the distinguished music festival „Settimane Musicali di Ascona“. I gladly accepted, not only because it is my home town, but also because I liked the idea of getting to know the other side of the music business, actually without knowing exactly what lay ahead. Moreover I felt tempted by the opportunity to promote artists of great integrity: Due to the complete independence of the “Settimane” it was possible to design a program that is wholly untouched of well-known illustrious promotion schemes, and guarantees only the highest artistic quality. A leap into the present – Three days ago the first festival’s edition under my responsibility was opened with an excellent concert: The City of Birmingham Symphony Orchestra under Andris Nelson gave us a brilliant performance of Dvorak’s 8th Symphony, after accompanying Latvian Soprano Kristine Opolais who sang Wagner’s Wesendonck-Lieder. Her wonderful interpretation revealed these famous pieces in a different light. She is capable of great dramatic expression and instinctiveness at the same time, and the composition benefits from her effortlessly powerful high register. It is no coincidence that songs were performed at the opening concert: The focus of this year’s Festival is on the German Lied. This can be understood as an Hommage to legendary German Soprano Elisabeth Schwarzkopf, who gave Lied Recitals at the “Settimane Musicali” several times, and even resided in Ascona for many years. The program aims to honor her memory. Therefore I’m particularly glad that I managed to engage two of Schwarzkopf’s own students: Christiane Oelze with Strauss’ „Four last Songs“, together with Junge Deutsche Philharmonie under David Afkham, and Matthias Goerne with Mahler’s „Rückert Lieder“ under Daniele Gatti conducting the Mahler Chamber Orchestra. Also the final concert of the whole season in October is going to be devoted to the fine art of Lieder singing: Together with Juliane Banse I will give a Recital with songs of Mendelssohn, Schubert, Liszt and Britten. Furthermore, this is an appropriate opportunity to continue my series of precious historical recordings - with Ferruccio Busoni himself! Many contemporary witnesses adored his virtuoso skills and his great sophistication. This recording can give us an idea of what they have meant with that. Mostly Mozart… and some Debussy! Many years ago, my teacher Cécile Ousset revealed to me that she is the owner of her teacher’s copy of Debussy’s Préludes. She was a student of Marcel Ciampi at the Conservatoire in Paris, who worked on this pieces with the composer himself. This score is simply overwhelming: Remarks, phrasings, fingerings are written in different colors and layers over every note and every chord, with comments and remarks on even the tiniest details, and in some places there are fine, black letters almost impossible to decipher – apparently the handwriting of Claude Debussy. For me as a young musician this has been an important lesson on how details need to be taken seriously. I have the feeling that especially the music of „Monsieur Croche“ unfolds only when this subtlety is being achieved. This might be the central reason why he is not widely regarded as one of the greatest composers of piano music – in my opinion a major mistake! Not only that his influence on the development of modernity has been just as important as Schönberg’s, and for postmodern music probably even more. Also, his works challenge the performer in a manifold way: They are technically demanding, but in addition to virtuosic pianism, he requires an equally virtuosic handling of colors, shading and character. In 20th century music not a matter of course. My recording session of the complete Préludes for Naive Classique is scheduled for Spring 2014. However, I’m very happy to present a selection of them already at Mostly Mozart Festival in New York, alongside with Brahms’ Händel Variations, and, of course, some Mozart. And finally, for anyone interested in historic recordings, I’d like to recommend Debussy as a performer of his own works. While listening I can’t help but admire his unique sense of timing and his dazzling use of the upper register. Since my first visit in Denmark, I have felt admiration for this beautiful, free and tolerant country. This time, I am looking forward to a marvelous chamber music concert with three outstanding musicians in Frederiksvaerk: Alexander Sitkovetsky, Lawrence Power and Torleif Thedeen. The program may seem challenging, but the listener will be rewarded for the effort. Mahlers erratic Quartet Movement and Schumann vigorous E-flat Major Quartet will be combined with Brahms G Minor Quartet – a masterwork full with dark poetry. Since I have been long connected with both Gstaad, where I have performed many times, and with the International Chopin Piano Festival Duszniki Zdroj, I feel happy to be present in this year’s editions again. The Menuhin-Festival shows that Gstaad is not only an expensive resort, but also offers highest musical culture. In my recital, I will combine works by Debussy and Liszt (from the Swiss year of Années de pèlerinage) that are especially important to me. In Duszniki, the wonderful nature and the very warm and friendly atmosphere create a unique spirit. My program is all about water: Schulz-Evler’s transcription of the Blue Danube Waltz encounters Liszt’s Au bord d’une source, Debussy’s La cathédrale engloutie and Chopin’s delightful Barcarole.